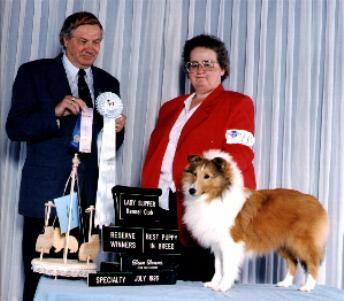 Tammie was our first sheltie, her outgowing personality and zest for life sold us on shelties as a breed. She loved to play with balloons and would carry them around by the knot until one of the other dogs would steal it away and burst it. She will always be missed and her memory carries on with her grandchildren here at SUNNYSEAS. 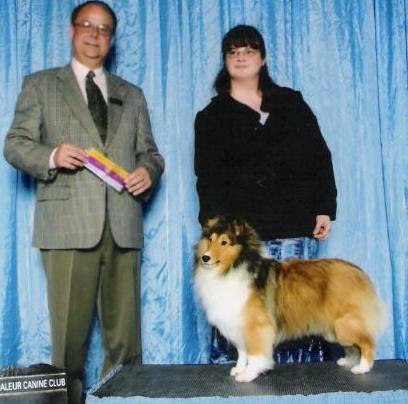 Jessica came from DeAnna Aston of Punkincrick Shelties. She had a excellent temperament and loved all puppies,hers and everyone elses! She was an excellent mother and was happiest with pups around her. Cancer claimed her, after a valiant battle. Known by her friends as "Puss", Fancy will live on here in her grandchildren and great-grandchildren. CH. SUNNYSEAS NIGHT FEVER Boogie was owned by Sue and Arne Borgersen. Ziggie was our first male sheltie, he grew too much, but his personality made him our favourite, so he stayed on here as our pet. We lost him to pancreatis. I know he is greeting our other beloved dogs as they arrive at the bridge. Star was our baby, she was from our first litter at SUNNYSEAS. She was our little watch dog and moms baby. She was happiest in my arms or in our bed. Heffer was our first sable, she will always have a special place in my heart. Our dear "BunBun" will live on here through her children, grand children amd great grand children. CH.SUNNYSEAS BLOSSOM'S AT OKEDOKIE. ( Blossom ) finished at 11 months..
SUNNYSEAS SASHA IN SATIN C.D.X. 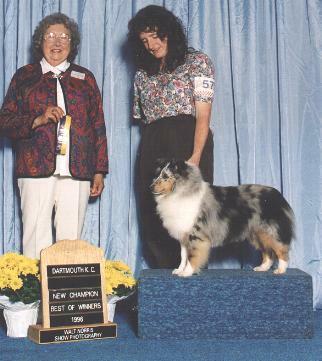 and CH.SUNNYSEAS INTERLUDE SHELHAVEN C.D. owned by Karen and Robert Henley. CH.SUNNYSAES LIBERATED LADY (B.I.S.& B.I.S.S.) ( Libbie ) is owned by Kathy Archibald. SUNNYSEAS OKEDOKIE MAESTRO C.D. ( Brodhi ) was owned and loved by Norine Hynick and her two Paul's. CH.SUNNYSEAS OKEDOKIE BLOCKBUSTER C.D.X. (SCOTTY) ( 1985-2001) Scotty was owned by Carol Levec. CH.SUNNYSEAS OURGANG BONNIE C.D.X. (1992-1997) Bonnie was owned by Nancy McRae. 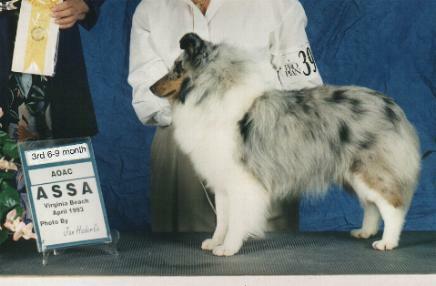 CH.SUNNYSEAS SEALOCH SILKEN TOUCH C.D. Silken was owned by Grant and Melissa Fancey. SEALOCH SUNNYSEAS DALLAS C.D. Dallas is owned and trained by Velma Ricketts. CH. HEELAND SUNNYSEAS RAVEN WINGS Teal was bred by Dottie Hammond and co-owned by Dottie and myself. She is now retired and living in a wonderful new pet home. SUNNYSEAS BILLY JOEL C.D. owned by Rod and Anne Malott.